Online Store lets you set shipping fees for individual products. 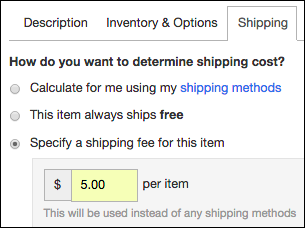 Besides setting a fee for a product, you also can mark a product for free shipping. 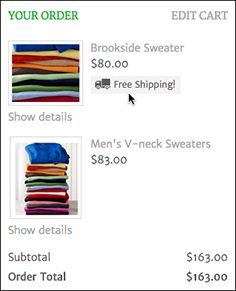 Products with free shipping automatically display a label on your storefront — making it easier for customers to spot those items. 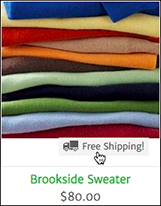 On the All Products page, click the product for which you want to set a per-item shipping fee. Click the product's Shipping tab. Specify a shipping fee for this item and enter a fee amount. Click Save and repeat for each product for which you want to set a per-item shipping fee. To see how the free shipping label appears to customers, click View Store. Scroll through your products to see where the Free Shipping! label has been added. Note: During checkout, customers can clearly see which items include free shipping.